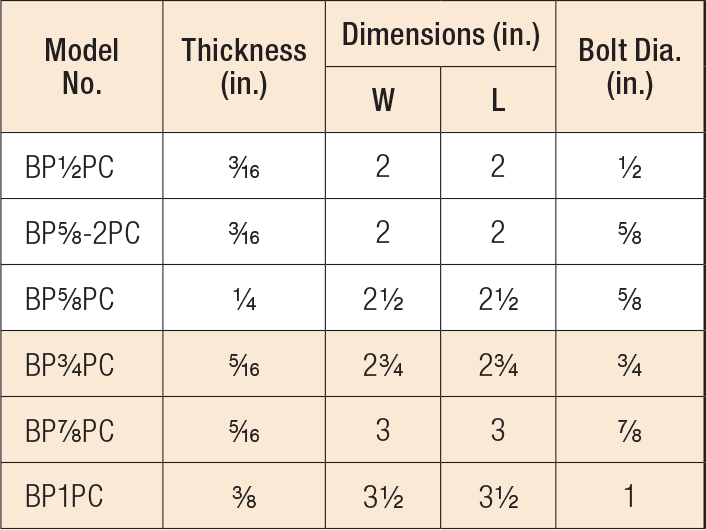 Bearing plates give greater bearing surface than standard cut washers, and help distribute the load at these critical connections. BP 1/2PC Prescriptive code: Products which meet prescriptive code requirements. BP 1PC Prescriptive code: Products which meet prescriptive code requirements. BP 3/4PC Prescriptive code: Products which meet prescriptive code requirements. BP 5/8-2PC Prescriptive code: Products which meet prescriptive code requirements. BP 5/8PC Prescriptive code: Products which meet prescriptive code requirements. BP 7/8PC Prescriptive code: Products which meet prescriptive code requirements. BPPC See specific model numbers for code listings.